-Enhance brain function! Yup, wouldn’t it be nice to actually get smarter and feel sharper while we’re at it? The fact is there is no one size fits all supplementation strategy. And the combination of vitamins, foods, and supplements can easily lead to getting too much of a few things, not enough of others, and ultimately, not reaching our goals. So, after poring over reports, books, and articles we here at EZ Wellness Club are excited to bring you the take aways from months of research, and a simple action plan that you can implement into your daily routine, that will bring you health, happiness, success… in short, once you get this figured out you’ll feel better and choirs of angels will sing in the background of your life. 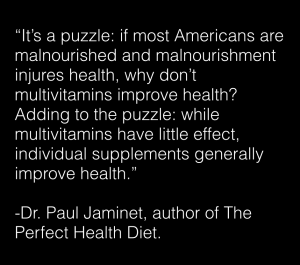 First though, we need to send HUGE LOVE to Paul Jaminet, Ph.D and Shou-Ching Jaminet, Ph.D., who, in my humble but correct opinion, wrote the book on the subject (no, they really did, see the link to it here in this post 😉 I highly recommend it. So if “individual supplements generally improve health” then which ones are they? And how much should you take? Here are some tips and recommendations on how you can supplement effectively, while not taking in toxic levels of stuff you don’t need. Pharmaceutical grade, metals free Fish Oil– 10000 for 60 days, then 2000-5000 MG depending on activity level and your size. Trace Minerals, alkalizing: Mimi’s Miracle Minerals. Contains over 70 trace minerals, has an alkalizing effect, and is anti-fungal and anti-viral. Our highest rated product on Amazon, with virtually zero returns. Once people start, they don’t go back. Vitamin E – Only if you are on a weight loss regimen, 15 MG per day. Vitamin C- 1 gram per day. It has many benefits, and no risks. The three most popular weight loss supplements in the last 10 years are definitely Green Coffee Bean, Garcinia, or Raspberry Ketones. These have all been clinically tested to reduce fat, even without diet or exercise. They can generally be purchased inexpensively on Amazon, and you may want to experiment with one at a time to see which one really works for you. Mimi’s Miracle Cell Food. Add this to your water and drink throughout the day, and basically become super human. Your body will use oxygen better, your cells will be nourished and rejuvenated, and your system will be alkalized. Post workout: Protein! If you are a supplement snob, and want the highest quality, check out Sun Warrior Protein. If you are more budget conscious, and want really good protein powder at a great value, here’s a great one. Glucosamine Chondroitin for joints. Tons of research, will help with a variety of joint related ailments. Take 1500 MG per day. Great inexpensive product at Costco. Hormone Balancing. Find a professional in your local area who can test you and advise on this. Testosterone boosters: T-Bomb 3XTREME. Great value, great results. DO NOT DO TESTOSTERONE DRUGS! Your body will stop producing it’s own T.
So there you have it, from me, Dave Sherwin, with insight and guidance from my personal health practitioner, the amazing Dr. Kepo’o. I have been following the supplementation strategy in this post for some time, and at the age of 50 I am literally the healthiest I’ve ever been, even more than when I played high school basketball, or raced in the triathlon National Championships. This supplementation strategy is solid, try the appropriate products we listed, chuck your multivitamins, and trust me, you’ll feel like a new person within a few months. 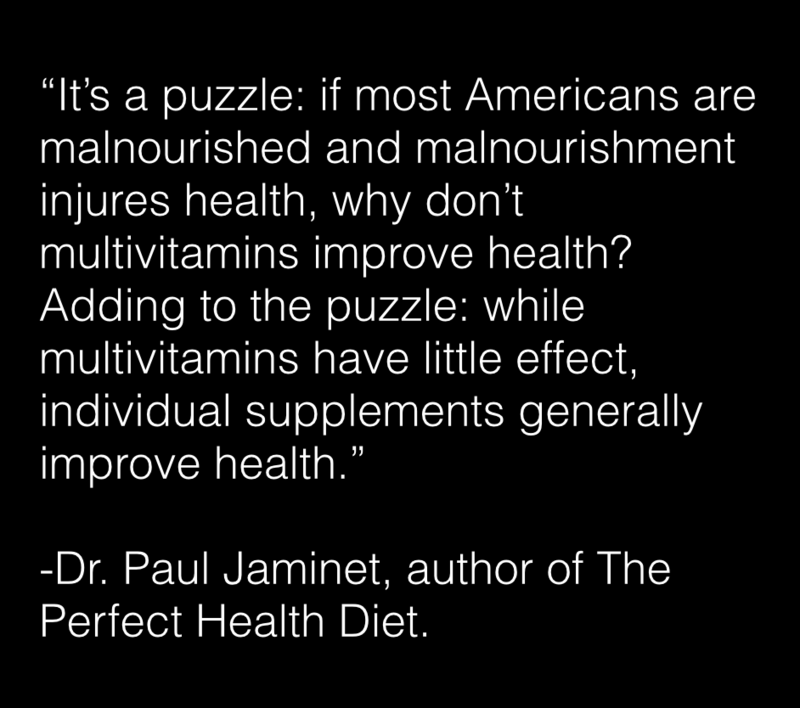 Great article here that not only covers the multivitamin debate well, it also references several great studies on the subject. For Vitamin E specific info, check this excellent piece from the Mayo Clinic.